Ugh. Sound like somebody has an axe to grind dating back to the Brits. Do they let foreign passport holders into the same bathrooms as Indian passport holders? Airport authority needs money really bad these days, that’s the issue. The issue is, like most developing countries, India looks upon foreigners as a special case, quite apart from their own people, quite different in kind. As in most developing countries it is not uncommon to have two pricing tiers and sanctioned, moreover, by the authorities, one for foreigners and one for locals; two differing regulations on almost every aspect of life and livelihood; two different attitudes towards human beings. Visiting the Red Fort everyone removes their shoes outside the entrance to save wear on the flooring, but foreigners of course are charged a fee by the shoe wallah. On my last visit one Indian – no uniform, no visible sign of authority – seems to have taken it upon himself to clear out all the foreigners, hurrying only the foreigners towards the exit. Asked why only the foreigners had to leave he just motioned us out saying “Go now, all foreigners out” or words to that effect. I ignored his silliness, and went on to see the fort as he hopped about behind me. China and India are not unique in these attitudes but rather typical. In the past, there was also a limit to how much foreign exchange could be bought, at the airport. About USD $20. Foreigners needed proof that they had legally exchanged non-rupees in order to change back their rupees into foreign currency. There were no exchange facilities, airside. The origin of this system was the government’s attempt to prevent the outflow of “black” money. As is true of much in India today, there has not been a break from the past when the reasons no longer exist. I think your basic attitude is inappropriate though: the RBI (the Indian equivalent of the US Federal Reserve) is only trying to control the outflow of non-taxed funds, which the US government also does, by not allowing transfers of more than $10,000 without reporting. 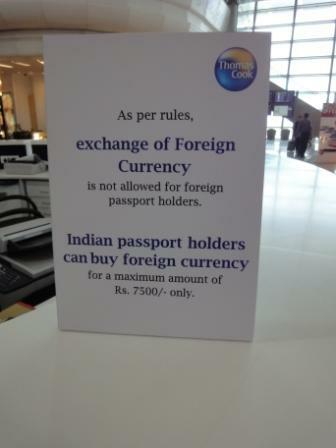 Also, in the old days, you couldn’t even use rupees in shops after security: foreign exchange only. The glass really is more than 1/2 full: the Terminal is a great improvement, which was sorely needed. How about focusing on some substantive issues???? Every airport has its own problems. I have to walk a mile in Singapore, before i can have a cigarette, for instance. Great comment. Reasonable explanation. Thanks. That noted, I’ll defend my “inappropriate” attitude! Overall, I find the physical facilities at the new airport – the hardware – to be a tremendous upgrade over the old one. There’s no question about that. But the human resources and the services – the software – are severely lacking, and very much locked into the DEL of the old. Indeed, foreign exchange isn’t the only service available to Indians, only – so is the airport’s public wi-fi (requires the user have an Indian phone number)! So, for foreign passport holders, no foreign exchange, and no wi-fi. Overall, as a foreign visitor, that doesn’t leave a very good impression. I didn’t and don’t want this post to become one long complaint against DEL. The setting itself is a huge improvement. But there’s more to an international airport than comfortable chairs (though those help). It’s the software, and the hardware, and the software at the new DEL is sorely reminiscent of the old DEL. I can’t help but laugh when people talk about India & China as if they’re in some kind of neck-and-neck race of economic growth. China’s so far ahead; even its unpleasant and inefficient bureaucracy is better than India’s. By the way, I think the WiFi in PEK requires a China Mobile number or something like that. Departing India back in 2006 or 2007 from the older terminals in Mumbai, once past security you could only officially exchange up to 200USD (get a receipt). Since i was stuck with about 300USD i had to change into ~100USD “under the table” with the guy at a different exchange rate or be stuck with rupees. That didn’t sour me on India but it still gnaws at me from time to time.